I was listening to a podcast about resort marketing the other day and they were debating what the best marketing for resorts was. If you think it is social media or email marketing then you would be wrong. One of the only things they all agreed on was that amenities is the number one thing resorts should spend money on to attract guests. When comparing accommodations people are more likely to choose a place that offers them more – stronger WiFi, more comfortable bedding and more activities, such as a waterpark. A waterpark is a huge draw to travelers since it offers them endless hours of onsite entertainment, but with that huge draw comes a lot of responsibility. 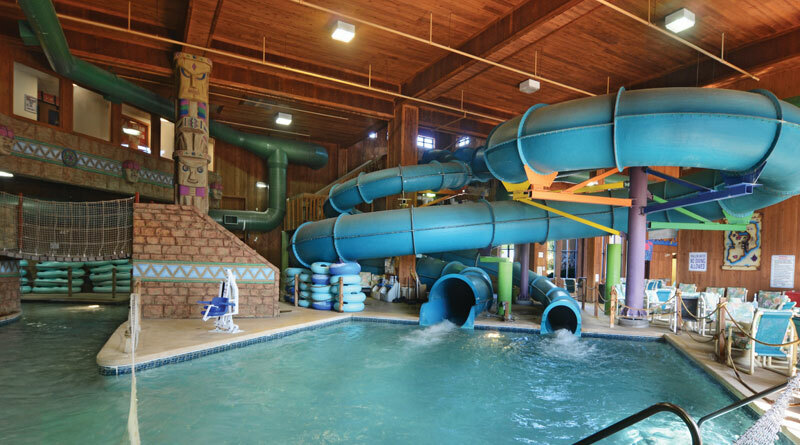 So, this month I spoke with Robert Rognrud, the General Manager of Polynesian Resort, a vacation property in the Wisconsin Dells that has both indoor and outdoor waterparks, about the exciting world of running both and resort and two waterparks! One of the hurdles that come with running a waterpark in Wisconsin is the ever-changing weather. Anyone who has ever watched fans with icicles on their face at a Green Bay Packers game can imagine just how frigid the winter temperatures get in Wisconsin. “In warmer states like Florida, when outdoor water features shut down they can clean them and have them back up and running, but due to the severity of Wisconsin’s winters each spring we have to practically redo the entire outdoor waterpark. Strip it down and repair all the damage that the wind, snow and cold temperatures have done,” said Rognrud. While the weather hits Wisconsin hard, it’s still known as the “Waterpark Capital of the World” which means that there’s a lot of waterparks and with a lot of waterparks means there’s a need for a lot of life guards. The Polynesian Resort is more than 200,000 square feet and has nearly 500,000 gallons of water which means they need to have 35 life guards staffed every summer. With this kind of demand for lifeguards the organization that provides certification, The Red Cross, couldn’t keep up with the high-volume of training so they began allowing resorts to become training centers. “In order to get lifeguards the proper training and certification while also not having to send them out of town to another facility and increase costs we decided to become a training facility. There’s a lot of training and inspections that go into becoming certified by The Red Cross, but for our property it’s been well worth it,” said Rognrud. If training, certifications and weather didn’t make having a waterpark on property sound like fun then just think about the joy of controlling water quality. Water quality is no joke. Contaminated water can be a matter of life or death in some situations so it’s not a topic to take lightly. The state of Wisconsin regularly check-ups on properties unannounced to make sure that their water is safe for guests. It’s a constant process to monitor which some places do by hand and others have automated. I realize this article doesn’t make having a water feature sound like a lot of fun with all the pieces that go into managing one, but there’s a lot of good to them too! Onsite water features keep guests on the property and keep them happy and engaged. The benefits of an indoor waterpark mean that people are more likely to book with you than a resort without one because weather no longer becomes a factor to their vacation enjoyment. According to Rognrud managing two waterparks and a large resort is no small task, but he’s enjoyed the challenge, the ups and downs of learning it all and the excitement that he gets to see on guests faces as they let loose in the Waterpark Capital of the World. Kelley Ellert is the Director of Marketing for Defender Resorts, Inc. based out of Myrtle Beach, South Carolina. She is a graduate of the Ball State University School of Journalism and has worked in the travel and tourism industry for more than nine years.